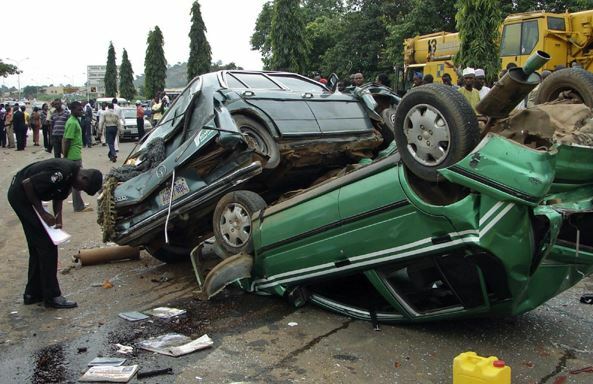 Three persons on Friday lost their lives while eleven others sustained various degrees of injury in a road accident, when a Mazda bus somersaulted near Makun city on the Lagos/Ibadan expressway. Mr Clement Oladele, the Sector Commander, Federal Road Safety Corps (FRSC), Ogun, who confirmed the incident, told the News Agency of Nigeria (NAN) in Abeokuta on Saturday that the somersault was preceded by excessive speed, tyre burst, and the driver’s subsequent loss of control. Oladele stated that the bus, with registration number FST 578 XM, somersaulted many times, leading to the death of three persons, while 11 others sustained various degrees of injury. “Three male adults, eight female adults were injured, while one male adult and two female adults were killed in the accident,” he said. The FRSC official said that the injured victims had been taken to Idera Hospital in Sagamu, while the bodies of the three people who lost their lives had been deposited at the morgue in Olabisi Onabanjo University Teaching Hospital (OOUTH), Sagamu . Oladele urged motorists to drive with standard tyres. He also advised them to use their day time running lights due to poor visibility common in the early morning and late evening hours. The post SAD! 3 Feared Dead, Many Injured In Lagos/Ibadan Expressway Accident appeared first on Naijaloaded | Nigeria's Most Visited Music & Entertainment Website.